Background: The implementation of patient education within a hospital is a difficult task that plays a key role in improving and controlling diseases and providing quality healthcare services. Objective: The current study evaluated the effect of patient education on the quality of nursing care and inpatient satisfaction in surgical wards of selected hospitals in Isfahan, Iran. Methods: This quasi-experimental study was conducted in 2014. The sample group consisted of 64 patients admitted to the surgical wards of select hospitals in Isfahan and selected using the voluntary sampling method. Participants were randomly divided into experimental (n=32) and control (n=32) groups. A patient education program was implemented for each subject in the experimental group (during hospitalization and after discharge), but no intervention was conducted for the control group. Data was collected from both groups before and after the educational intervention using the standard questionnaire SERVQUAL to measure expectations (with a reliability of 87%), perceptions (with a reliability of 85%), and inpatient satisfaction (with a reliability of 83%). Data was analyzed using descriptive statistics, univariate and multivariate analysis of covariance, Kolmogorov-Smirnov, Chi-square, and t-tests in SPSS software (ver. 20). Results: The results of covariance analysis showed that the patient education program significantly increased the mean scores of the quality of nursing services and inpatient satisfaction in the experimental group compared with the control group (p<0.01). Conclusion: A patient education program is an important pillar for improving public health. It is also a low-cost intervention to increase a patient's hope in living a good quality life. Walling AM, Maliski S, Bogorad A, Litwin MS. Assessment of content completeness and accuracy of prostate cancer patient education material. Patient Educ Couns. 2004;54(3):337-343. doi:10.1016/j.pec.2003.10.005. Tolooee M, Dehghan Nayery N, Faghihzadeh S, Sadooqi‐Asl A. Motivational factors for nurses with patient education. Hayat. 2006;2(12):43-45. [Persian]. Purraberi M, Jamshidi N, Soltani Nejad A, Sabzevari S. The impact of nursing on patient satisfaction and patient education on knowledge, attitude and practice of cardiac intensive care unit nurse. Journal of Health and Care. 2011;13(1):30-36. [Persian]. Salehi A. A survey of educational needs in health-therapeutic centers of Isfahan in 2005. Regional Seminar on New Methods of Patients Care and Education. Ahvaz: Islamic Azad University. Ahvaz Branch; 2005. [Persian]. Rankin SH, Stallings KD, London F, eds. Patient Education in Health and Illness. Philadelphia, PA: Lippincott Williams and Wilkins; 2005. Berwick D. Postgraduate education of physicians: professional self-regulation and external accountability. JAMA. 2015; 313(18):1803-4. doi:10.1001/jama.2015.4048. Bastable SB, Gramet P, Jacobs K, Sopczyk D. Health Professional as Educator: Principles of Teaching and Learning. UK: Jones & Bartlett learning; 2011. Cardiovascular disease statistics. American Heart Association website. http://www.americanheart.org/downloadable/heart/1105390918119HDSStats. Lewis SL, Bucher L, Dirksen SR, Heitkemper MM. Medical Surgical Nursing: Assessment and Management of Clinical Problems. Elsevier; 2011:49-50. Arian M. The effect of designed walking program with holistic nursing approach on serum ferritin and heart problems of thalassemia major patients [Thesis]. Tehran: Tarbiat Modares University; 2013. [Persian]. Emami Razavi H, Mohaghegh MR, Razavi S. Accreditation standards for hospitals in Iran. Tehran: Sound Publishing Center; 2010:73-80. [Persian]. 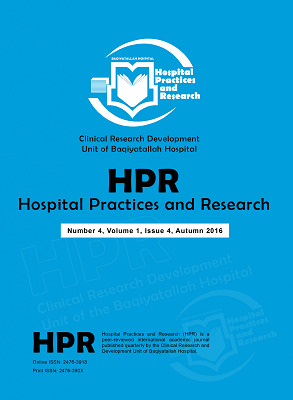 Bahrampour A, Zolala F. Patient satisfaction and related factors in Kerman hospitals. East Mediterr Health J. 2005;11:905-912. [Persian]. Nouhi AS, Pooraboly B. Educational requirements of the discharged patients and their satisfaction about nursing educational performance, Kerman, Iran. Hormozgan Med J 2009;13(3):206-212. [Persian]. Taylor N. A Patient education program supported by staff training can reduce the rate of falls for older patients during inpatient rehabilitation. J Physiother. 2015;61(4):224. doi:10.1016/j.jphys.2015.07.016. Zimmer A, Blauer C, Coslvosky M, Kappos L, Derfuss T. Optimizing treatment initiation: effects of a patient education program about fingolimod treatment on knowledge, selfefficacy and patient satisfaction. Mult Scler Relate Disord. 2015;4(5):444-450. doi:10.1016/j.msard.2015.06.010. Du S, Hu L, Dong J, Xu G, Jin S, Zhang H, Yin H. Patient education programs for cancer – related fatigue: a systematic review. Patient Educ Couns. 2015;98(11):1308-1319. doi:10.1016/j.pec.2015.05.003. Coates VE. Education for Patient and Client. London: Routledge; 1999. Redman BK. The Practice of Patient Education. 8th ed. New York: Mosby; 2001. Krupat E, Fancey M, Cleary PD. Information and its impact on satisfaction among surgical patients. Soc Sci Med. 2000; 51(12):1817-25. doi:10.1016/s0277-9536(00)00113-1. Bastable SB, ed. Nurse as Educator: Principles of Teaching and Learning for Nursing Practice. Boston: Jones and Bartlett; 2003. Mehdipour R, Jamshidi N, Soltani Nejad A, Sabzevari S. Effects of nurse education on both patients’ satisfaction of teaching patients, and nurses’ knowledge, attitude and performance in intensive care units of teaching hospitals. Journal of Health and Care. 2011;13(1):29-36. [Persian]. Shojaee A, Tahrir B, Naderi N, Zareian A. Effect of patient education and telephone follow up by the nurse on the level of hope in patients suffering from heart failure. JNE. 2013;2(1):16-26. [Persian].